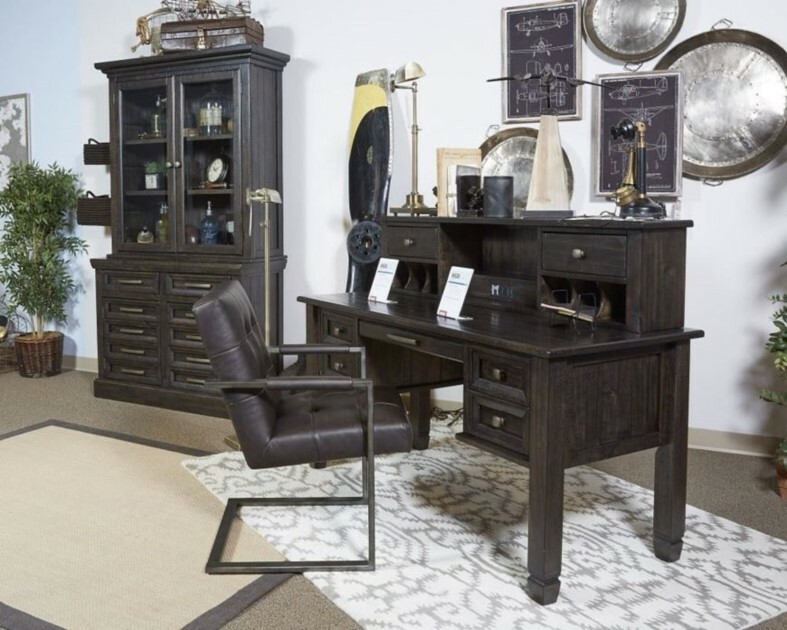 Inspired by the timeless appeal of American classic furnishings this home office desk revisits tradition in style. Rough milled pine is naturally textured and enhanced by a deep finish with gray undertones. Ample drawer storage and file cabinet space make it all the more functional. Looking for a desk with a high-style look on a smaller scale? Look no further! Inspired by mid-century design, this clean-lined and compact small leg home office desk is everything you want and nothing you don’t. The faux concrete top is a striking contrast to the desk’s rich walnut-tone finish. Inspired by the timeless appeal of American classic furnishings—where clean lines, sturdy silhouettes. and thoughtful detailing speak volumes—the Townser Swivel Home Office Chair revisits the quintessential banker’s chair in style. And with a sumptuously cushioned seat, 360-degree swivel and adjustable height/tilt feature, it sure takes a turn for the better. Are Leaning toward a mid-century inspired look? If the answer is yes, this home office corner table may work beautifully for what you have in mind. Sporting a dark, complex finish, this canted leg desk truly is striking from every angle. On top of that, the clear glass top clearly adds an element of drama. This Counter Height Desk Chair offers a unique home office experience. The chair has an elegant scrolled backrest design and six wooden stretchers for support. Nature is richly nurtured in this home office desk. Its marvelous mango wood is lightly treated to a weathered tone finish to showcase the grain in all its glory. Set on casters, the sleek metal base infuses an urban industrial feel. Boasting a casual farmhouse vibe, this stunning home office cabinet will look great in any space. The sliding barn door provides access to both sides of the shelved storage space, and the wire brushed finish of this piece gives it its relaxed vintage style. For fans of urban industrial design, this home office desk chair steals the show. The chair’s metal C-frame in a blackened gunmetal finish is sleek and ultra modern. Crafted for looks and comfort, the tufted box seat, wrapped in a “weathered” faux leather upholstery, is loaded with a retro chic flair. Whether paired with your home office desk or as extra seating at the dining room table, it’s a feast for the eyes. Make a striking compromise with this home office desk. Generously scaled and loaded with charm, it includes a trio of smooth gliding drawers to help you stay organized. This unique casual look features canted and angled elements with farmhouse construction. The desk features angled leg structure, three drawers and an inset faux cement top. This piece features a faux cement top and sliding barn door with dark gray hardware concealing open shelving. This L-desk & return features drawers with dovetail joinery and ballbearing extension guides. The top drawer has felt lined bottom and a three section charging box and three outlet corded powerbar. The center drawer has two removable/adjustable dividers and bottom file drawer accepts letter size files. As a home office desk or to place in your foyer for a handy place to sort mail and stash you keys, this versatile writing desk in a smokey grey finish fits the bill. Slender iron legs have an open architectural appeal as they rise up in a triangular formation, supporting the clean lines of the body. The two ample drawers for storage, and a large surface area for work or display guarantee you will find many uses for this piece.